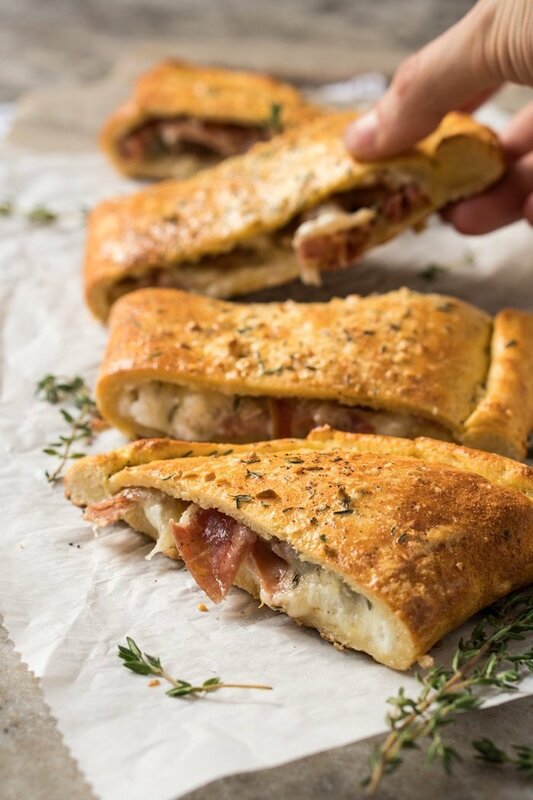 This gluten free and keto calzone pays a great homage to the classic Italian turnovers made with pizza dough. This one, however, uses our (dairy free!) keto dough to yield an awesome low carb dish. This is a good one guys, a veeery good one! 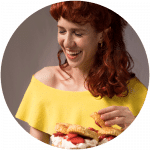 In my quest to discover all the possible uses of our (dairy free!) 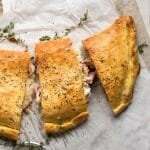 keto dough, it turns out that making awesome calzoni (i.e. 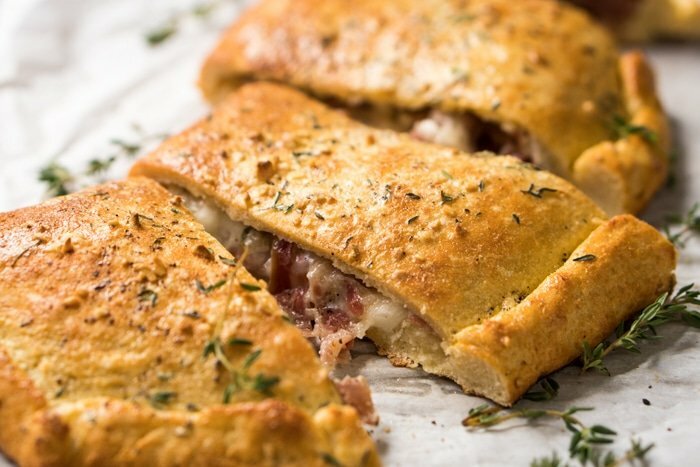 calzones) is at the top of the list. The taste and texture compliments beautifully any and all classic fillings. I opted here for a simple (and highly suggested!) 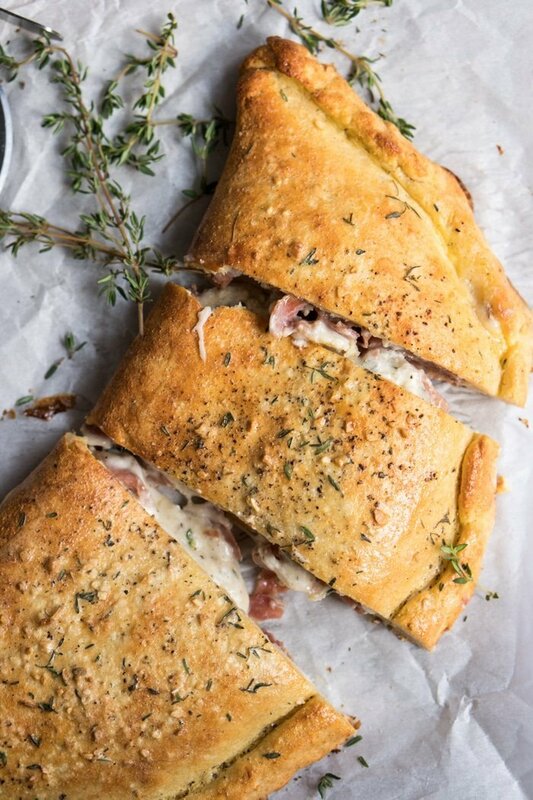 filling of prosciutto, mozzarella, goat cheese and thyme (non-negotiable). But you really can do your own thing here! Feeling lazy? You can also whip up a 15-minute stove top pizza with this dough! Or some keto cinnamon roll knots, but that’s a different story. 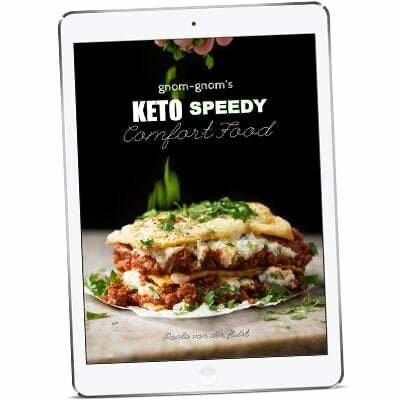 Oh, and if you’re looking for a more ‘traditional’ keto pizza, do check out our good ‘n proper pizza crust. It’s made with yeast, and definitely has a more ‘traditionally Italian’ taste, texture and mouthfeel. We use here what started as our grain-free tortilla dough here…! A little bit wetter, and with a tad bit more baking powder. 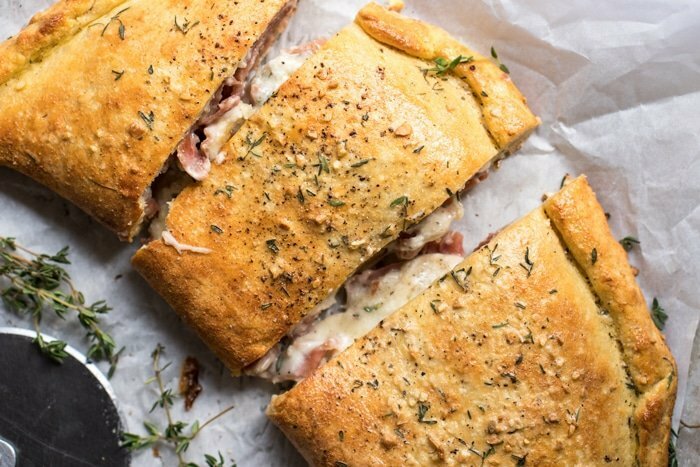 Depending on how thin you roll it out, a batch yields roughly an 11-inch calzone. Our preference is to roll it roughly 12 inches in diameter, add filling, fold, press edges together and fold them inwards. Preheat oven to 400°F/200°C. Line a baking tray with a baking mat or parchment paper. Roll out dough between two sheets of parchment paper with a rolling pin. You can play with thickness here, but we like to roll it out nice and thin (roughly 12 inches in diameter). 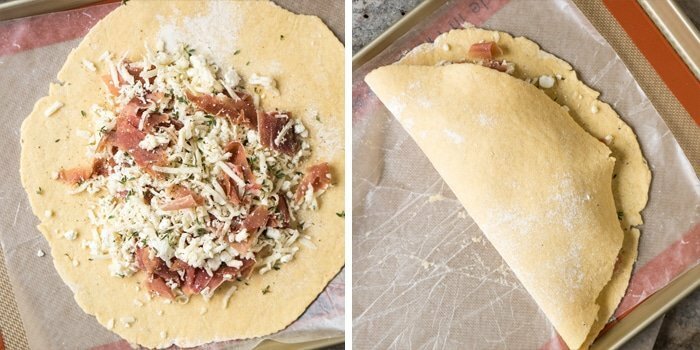 Pile the toppings on top of the dough, fold the dough in half, press the edges together and fold to seal. Brush with egg wash for a deeper golden sheen (optional) and sprinkle some thyme (optional). 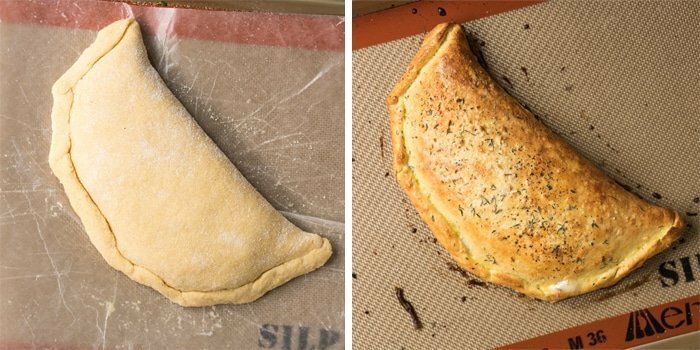 Place calzone in prepared tray, brush with egg wash (optional, for a golden sheen). Bake for 20-25 minutes, until golden all over. Serve right away. Please note that nutrition facts below are estimated for the dough only, per 1 slice (assuming a 6-slice cut up). the title says, ‘dairy free’, yet you use mozzarella…how is that? This looks delicious! I have a corn allergy and Xanath Gum is made from corn sugar. I’m confused about it being grain free? Any other ingredient that could be substituted? I baked these for yesterday dinner using psylium husk powder (5tbs of it for 2ts xanthan gum) and they turned out quite good. One slice? 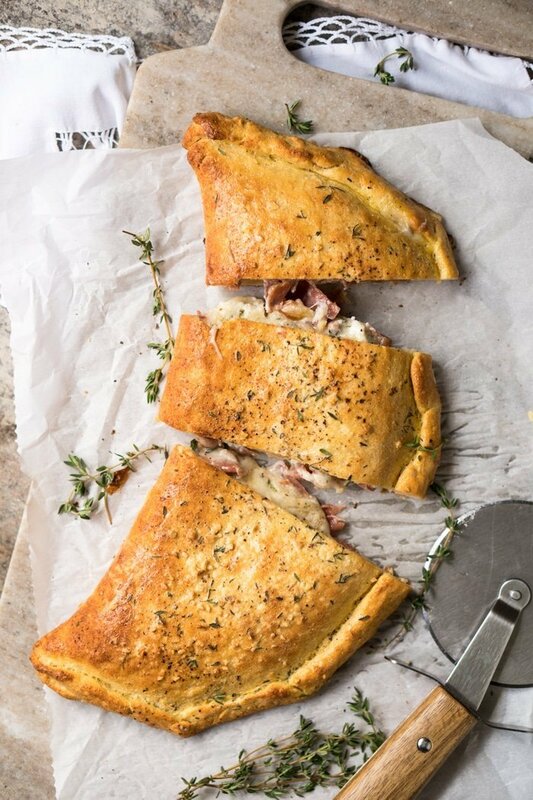 So you’re supposed to make a calzone with this recipe, slice it into six pieces, and one of those pieces is a serving?